In 1963, School of Communication Professor Russell Williams was enjoying a comfortable childhood in the Washington, D.C., neighborhood of Benning Heights, a primarily black community. By then, the D.C. public schools had been integrated, as had the military, the federal work force, and public accommodations around the city. Black people made up more than 50 percent of D.C.’s population. Still, the races tended to keep their distance. When Williams and his classmates were transferred from a mostly black elementary school to a white one in an effort to further integrate schools, the impact was immeasurable. He remembers it as one of the most pivotal moments of his youth. "It gave me the opportunity to sit with white kids and ask about their lives. I thought their lives were just like they were on Leave It to Beaver or My Three Sons," Williams said. "I could now have a dialogue with a community of people I had never talked with before." Fifty years ago, Washington, D.C., was a very different place, as was American University. Looking back through the lens of the civil rights movement, both the city and the institution have changed for the better. 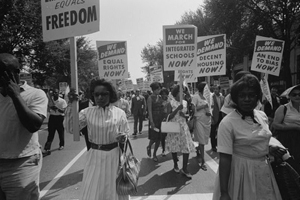 1963 is often considered the year that sparked the modern civil rights movement and neither D.C. nor AU were untouched by the events that would pave the way for a more racially just nation. Since its founding in 1893, AU has been an open and affirming campus, in keeping with the Methodist tradition. While the university didn’t have its first black applicant until 1936, black students were never barred from admission. By 1963, the black student population had risen into the hundreds. Slowly, civil rights activism began to spread around campus, but more on an individual level than a macro level, said university archivist Susan McElrath. The March on Washington, led by Dr. Martin Luther King Jr., in August of that year, helped spur a more urgent discussion of civil rights on campus. School of Public Affairs Associate Professor Steven Taylor moved to D.C. in 1974 from Buffalo, N.Y., when he was 16. Because D.C. was not a state, it could not claim states’ rights with regard to race issues. As a result, it was slightly quicker to desegregate. Taylor recalls the District was a beacon of hope for the black population in the southern part of the country. "People had a lot more optimism because segregation had ended here earlier. D.C. was surrounded by segregated cities in Maryland and Virginia and that contrast showed the potential for change," Taylor said. In a way, Taylor said, D.C. was like a cocoon. It didn’t experience the kind of racially motivated violence that other cities in the south had seen and it was home to a president who made civil rights a priority. In 1963, President John F. Kennedy called for the Civil Rights Act, which would abolish major forms of racial discrimination. The civil rights activism that sparked the modern movement began in the spring of that year. First, activists launched the Birmingham campaign against segregation in early April. King was arrested shortly thereafter and wrote his famous "Letter from Birmingham Jail." In June, when AU students had gone home for the summer, Alabama Gov. George Wallace attempted to prevent black students from entering the University of Alabama. Wallace stepped aside after being confronted by federal marshals. The following day, civil rights leader Medgar Evers was assassinated in Jackson, Miss. Two months later, King and several other civil rights leaders, including now-Rep. John Lewis (D-Ga.), Ray Wilkins of the NAACP, and Medgar Evers' widow, Myrlie, marched on Washington. It was here that King delivered his stirring "I Have a Dream" speech. At the behest of the Methodist church, AU hosted about 100 marchers, both black and white, on campus. College of Arts and Sciences Assistant Professor Ed Smith was 20 years old when King marched on Washington. He remembers standing near where the Korean War Memorial is now, listening to King’s inspiring words. "I knew the country would never be the same again. Everyone knew a huge change had taken place," he said. "After the speech, people were just wandering the streets, black and white, holding each other." Activists were breaking down barriers and by the end of the decade the country would be well on its way to being a "biracial society," Smith said. It was a far cry from the Washington of Smith’s youth. When he was born at Howard University Hospital in 1943, Washington, D.C., was still a segregated city. The events of that summer and the subsequent march inspired discussion when AU students returned for the fall semester. The Student Association hosted lectures on civil rights featuring national movement leaders. One of those leaders, Joseph L. Rauh, one of the country’s foremost civil rights lawyers spoke on campus later that fall. From The Eagle, Nov. 1, 1963: "For Rauh, the manifestation of civil rights legislation will occur when the white liberal realizes that there is no half-way and no compromise." Fifty years after the events that ignited the modern civil rights movement, the AU community is still thinking critically about issues of race and equality. The questions are different today, said Tiffany Speaks, senior director of the Center for Diversity and Inclusion, but they are part of the legacy of the civil rights movement. "There’s a picture of Martin Luther King Jr., in my office that serves as a reminder of the work we’re trying to do," she said. "He advocated for changing the legal framework as well as creating social change. And that’s what I see and hear on campus these days. I feel we’ve really, truly made great strides."